BlueChip Picks is a small company based in Knoxville, TN. These picks are the result of the hard work and planning of Matthew Goins along with Allen Goins, Brian Phillips, Tyler Morris and Shain Hansard. From design to testing, this five man crew works to create the best possible product. 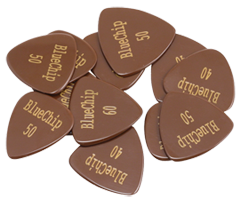 BlueChip takes great pride in seeing our picks used to help create great music. We have spent many long days and nights brainstorming and testing ways to make these great picks out of an amazingly expensive material and still sell them affordably, creating the best shapes, and perfecting the finish and bevel. To help solve those problems, we create our picks on industrial grade CNC machines in our professional machine shop. These machines and their operators work daily with extraordinarily close tolerances and we must hold our picks to the same standard. One question we always hear, “Why are they brown and not blue?” BlueChip picks are not blue, but were named after our machine shop, Blue Chip Machining. They are, and will always be brown due to the properties of the material used to create them. We trust you will enjoy playing with these great picks as much as we enjoy creating them.